Discussion in 'PC/Mac Builders, Mods, Peripherals - New' started by StevieePazz, Feb 11, 2019. I am ready to buy/build a new computer, a new rig, ect: Currently I use a MacBook Pro 13", Duo Core i5 with 8gb of ram, weak I know... system overloads have been a close friend. I use Logic Pro X & Cubase, and route all audio through my Apollo MKII Quad. I use two Focal Alpha 5's for my monitors. I was going to just get an iMac pro, but w.t.h are these prices? So, I decided I would buy a PC through Splick.Audio but, after a lot more education I am sort of stumped. Why not just build the PC myself? It would save a lot more money, yes? I can also get specific parts. I'm not stupid, but also have a tendency to overthink. It doesn't seem that difficult, but maybe it would be smarter just to purchase a prebuilt rig and focus solely on the craft? 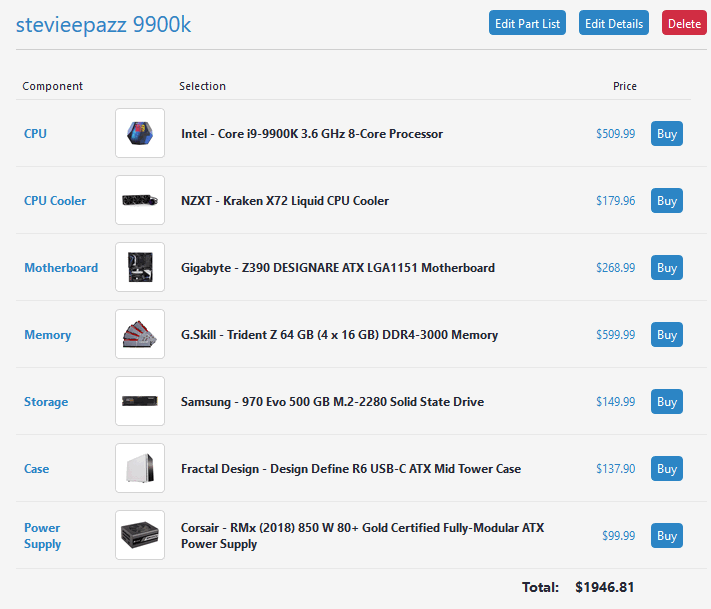 I have built a PC through pcpartpicker.com, and would love to get some feedback if possible. I could only find one motherboard that has prebuilt Thunderbolt 3; going to need an adapter since the Apollo is Thunderbolt 2. Also, feedback on just the whole situation in general would be so appreciated. I use Spitfire Samples, Xfer VST's, UAD Plugins. I looked at your config and I think you are very much on the right track. I just built a similar box (I've been building since 1984. Outside of laptops I've never owned a pre-built system.) with a few differences that I would recommend. 1. I'm not familiar with the exact model of power supply. I would use a power supply based on choices from quietpc.com . 2. Ditto for PC Case. I've had great success with ThermalTake and Fractal Design. Be Quiet! seems to also be a good choice. 3. I only see one SSD, the m.2. OS, projects, samples should all be on separate drives IMHO. 4. I see no reason to use water cooling. It is louder than Noctua coolers are always a good choice. 6. I don't run big templates, but I've found that i7 is still the minimum Intel architecture I would use. Others will argue that statement and it really is subjective based on what software you are running. My new build is i9 and I am loving the performance, but it is in the end probably more than I need for my needs. The builds I have made are almost dead silent. Quieter than the iMac I used to use. I also (and I'm knocking on wood big time) have had no stuttering, etc. issues in the past. It is too soon to tell with my new z390 build, but so far so good. I'd substitute the i9-9900k for your CPU. I just replaced CPUs in two other computers with that model and it rocks. It's not that much more expensive than what you have. Especially if you use a lot of Spitfire, no way would I use an i9; one of the CPUs I replaced was an i7-7700k and it was "real good," but nothing like the i9. If this is a gaming PC/connected to the Internet, maybe Windows Home is ok, but if, by contrast, it's really a music computer, I would definitely get Windows 10 Pro so you can turn off stuff if you don't need it. Like Defender and all that. The PSU fan will remain off.